The 10 Best Wings in Rhode Island! The Ocean State knows how to do wings right. Turning out delicious crispy, juicy, and even bacon-flavored wings—Rhode Island’s selection is vast and varied. Snack on a classic or discover something new at the 10 best wing spots in Rhode Island. You might consider yourself a bonehead if you love having as many options for wings as possible, can’t resist some juicy chicken, and find yourself coming back time and time again! With plenty of space and friendly servers, Boneheads offers plenty of weekly events including Sunday Bing music trivia and Monday football viewing parties! Maria’s is best known for their delicious pizza pies and quick delivery, but you’ll want to try their incredible wings as well! While you might be tempted to go for a classic barbeque flavor, try one of Maria’s bolder, more unique flavors such as the buffalo sauce or the Thai peanut. Located in Providence’s fast-changing Jewelry District, The District has undergone its own renovations and is now bigger and newer than ever. Go for The District’s flavorful dry rub wings, or if you’re looking for something a little saucier, you’ll love the Asian Chili wings. Their salads, burgers, and sweet potato fries are equally as delicious, too! This narrow little place is constantly buzzing with college kids and bar-goers on the weekends, but even crowded, PJ’s is well worth it! 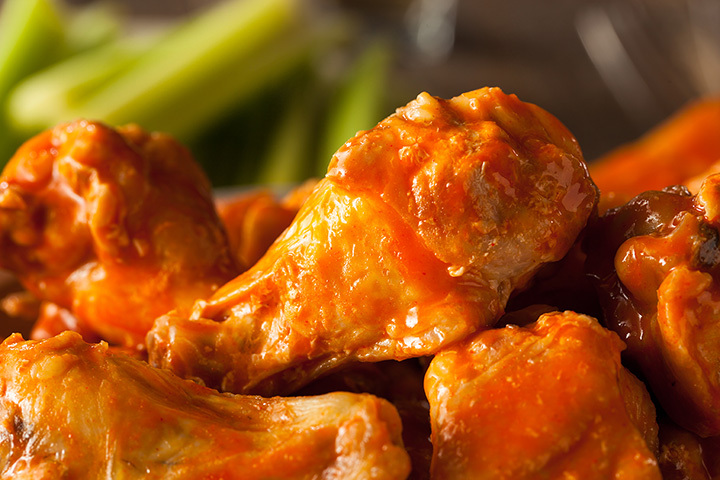 Go for the Buffalo wings, the perfect complement to a good beer and some great friends! Looking for wings loaded with flavor? Tim & Andy’s is the place to be—go for the garlic parmesan, a classic Buffalo, or some sweet teriyaki. The wings are plump, juicy, and amazingly tasty! The Shanty’s wings and pickled vegetables can’t be beaten. Grab a dozen in your favorite flavors, a side order of sweet potato fries, and relax in this well-curated and classic Rhode Island restaurant. Have you ever tasted bacon chicken wings? No? While now you have, and you won’t ever want to have wings any other way. The wings are perfectly crispy and evenly coated with just the right amount of sauce. Find this elusive food truck once and you’ll quickly want to hunt it down again for the next meal! Citizen wings are battered heavily—much more than your typical place—which delivers a huge crunch and a juicy center. Make sure to grab some ranch for dipping, which will help elevate these wings to the next level. Another fun fact? Their wings are also brined in Foolproof beer! Though the Thirsty Beaver is more than a little corny, you’ll find it charming more than anything! The bar is enormous, and perfect for sharing wings with a large group. Grab some garlic parmesan wings either at their restaurant location or for takeout—you won’t be disappointed either way. Grab some wings from Eddie’s and head out to the beach, the ideal spot for munching. Their wings are perfectly cooked, with a sweet flavor at first and a kick that hits you at the end. Grab some pulled pork and mac and cheese while you’re at it!